This is the second in the series of posts about integrating the teaching of GeoGebra and Mathematics in lower secondary school. The first post was about teaching the point tool and investigating coordinates of points in a Cartesian plane. This post outlines a teaching sequence for introducing the concept of square roots in a GeoGebra environment. Of course you can do the same activity using grid papers, ruler and calculator. 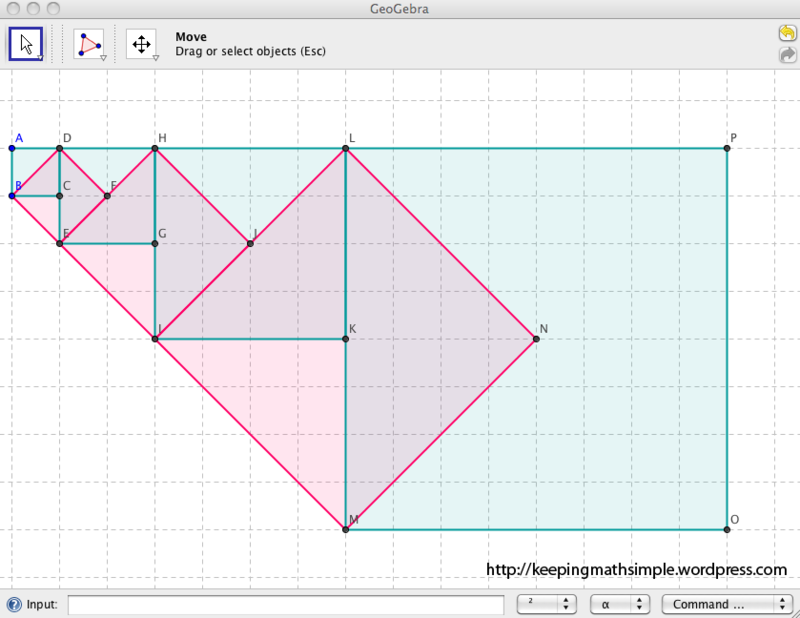 However, if the students have access to computers then I highly recommend that you use GeoGebra to do this. In my post GeoGebra and Mathematics, I argued that the more the students understand the mathematics behind GeoGebra, the more confident they could become in using this tool. The earlier the exposure to this environment, the better. The way to do this is to integrate the learning of the tool in learning mathematics. Click here to download this free software. The figure below is the result of the final activity in my proposed teaching sequence for teaching square roots of numbers and some surds or irrational numbers. The GeoGebra tool that the students is expected to learn is the tool for constructing general polygons and regular polygons (the one in the middle of the toolbar). The teaching sequence is composed of four activities. Activity 1 involves exploration of the two polygon tools: polygons and regular polygons. To draw a polygon using the polygon tool is the same as drawing polygons using a ruler. You draw two pints then you use the ruler/straight edge to draw a side. But with Geogebra you click the points to determine the corners of the polygon and Geogebra will draw the lines for you. In the algebra window you will see the length of the segment and the area of the polygon. Click here to explore. GeoGebra shows further its intelligence and economy of steps in Activity 2 which involves drawing regular polygons. Using the regular polygon tool and then clicking two points in the drawing pad, GeoGebra will ask for the number of sides of the polygon. All the students need to do is to type the number of sides of their choice and presto they will have a regular polygon. Click here to explore. Activity 3 is the main activity which involves solving the problem Draw a square which is double the area of another square. Click here to take you to the task. Activity 4 consolidates ideas in Activity 3. Ask the students to click File then New to get a new window from the previous activity’s applet then ask them to draw the figure above – Squares and Square Roots. You can also use the figure to compare geometrically the values of and 2 or show that = 2 . This activity can be extended to teach addition of radicals. Of course the teacher should be more familiar with GeoGebra than their students. Click here for tutorials courtesy of my colleague. Go to #IV of that page. Like the rest of the activities I post here, the learning of mathematics, in this case the square roots of numbers, is in the context of solving a problem. The activities link number, algebra, and geometry and this time, technology. Click here for the sequel of this post. I have been reading your post regularly. They are highly informative and helpful.